I must say, I was faintly surprised to find that, in addition to starring in The Pretty One, Zoe Kazan did not contribute to the screenplay, so marked it is by the same wishy-washy sensibility that dragged the premise of her 2012 feature Ruby Sparks down from the mountain of its spectacularly dark premise (a writer's fictional creation, the embodiment of everything he wants in a woman, suddenly comes to life) and into the valley of forceful reassurance and tonally deaf endings. 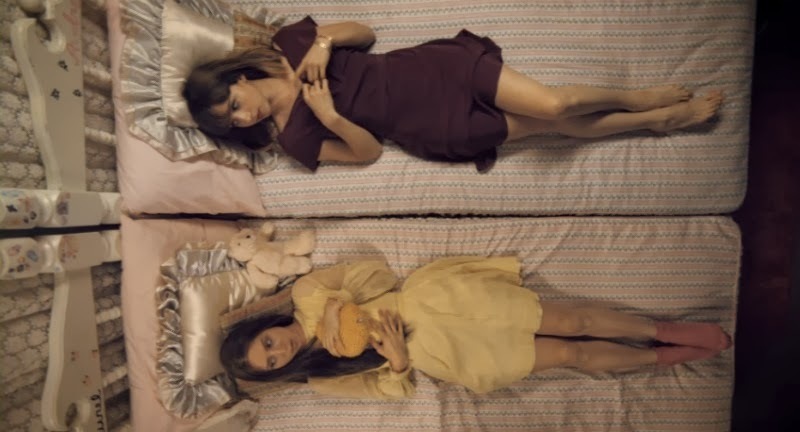 LaMarque's film, her first feature, also has one hell of a premise (though familiar to those who saw, or at least saw ads for, the Sarah Michelle Gellar TV show Ringer) - following a deadly car accident, Laurel assumes the identity of her more-successful-and-popular twin sister Audrey (both played, skillfully, by Zoe Kazan). At first, Laurel is merely mistaken for Audrey, but once she recovers her own memories, she can't help but continue the charade (fantasy?). After all, Audrey lives in her own spectacular apartment, while Laurel has remained at home, caring for her father, since their mother passed; Audrey has a successful career as a real estate agent, while Laurel helps their father create forgeries of famous paintings to sell to collectors (get it, because copies); Audrey has been immensely successful with men, while Laurel only just lost her virginity to a high school boy she used to babysit. And worse, she's far more into he than vice-versa. Moreover, assuming Audrey's identity becomes a way for her to still feel connected to her sister. There's plenty that LaMarque and Kazan suggest about the grieving process that is, or at least could be, incredibly rich material for a film. Unfortunately, LaMarque sticks instead with letting the entire dramatic tension hinge on whether or not Laurel will eventually reveal who she is, and when that's your dramatic premise, she can't just not say anything. The film is so eager to please and reassure its audience that by the time the chips are down, not a word is left unsaid. The rest of the film becomes a series of declarative statements, some of which are fairly affecting (John Carroll Lynch is especially good as her father), many of which are just way too desperate to appear vulnerable that they feel false an manufactured. Kazan hits some very spectacular notes early on, but there's something about LaMarque's compositions (sometimes wide, sometimes shoving her subject into a corner of the frame) that distances us from the immediacy of the emotion without offering an intellectual consideration to embolden it. It seems at once somewhat reaching to be haunting and dreamlike but also super-likable. The cast comes close to grasping that goal, but the confused direction and tame screenplay keep it forever bound to mediocrity. It doesn't help that it exists in one of those worlds in which no one has an actual job that they actually have to report to five (or even two) actual days each week, yet never seem to struggle or have to make compromises in their made-up careers. It's great that Laurel's father can just fake paintings all day, so successfully that he doesn't even have to sell any of Laurel's shortcoming efforts, or that Laurel's new boyfriend (Jake Johnson) sells used books from his house, but they're more excuses than explanations for how they can just do whatever they want, whenever they want. This is one of those sort of stock complaints about the cinema in general (Roger Ebert wrote, of Billy Wilder's 1960 classic, "In many movies, the characters hardly even seem to have jobs, but in The Apartment they have to be reminded that they have anything else), but seems exacerbated here by the simple fact that so little seems to truly affect these people in a permanent way (even the grieving process is more alluded to than invested in), at least give them a stressful job or something. the firemen are rarely necessary. The public stopped reading of its own accord, he explains. remember the newspapers dying like huge moths. No one wanted them back. No one missed them. And then the Government, seeing how advantageous it was to have people reading only about passionate lips and the fist in the stomach, circled the situation with your fire-eaters. don have a state-run media, and there a wealth of great journalism available to the American consumer today, although finding it takes more effort than it should. Sadly, few people make the effort. Many replica handbags more choose, instead, to read and watch only the media that cartier replica presents the world in a context with which they rolex datejust replica personally agree. So, the Right watches FOX News and reads The Wall Street Journal, while the Left swiss replica watches watches MSNBC and reads The New rolex masterpiece watches York Times. Is there not something replica wathces similar in the manipulation of rolex replica information described by Captain Beatty? A Sequel cash loan is temporary unprotected money enhance that is ready to use your postdated check as security. If would payday loans montgomery love on associate everyday enhance cash loan but would love further a chance to pay it returning, a Sequel cash loan might match well for you.